The Russian Federation is the largest country in the world. The Seven Wonders of Russia are seven of the “coolest” places in Russia, determined by a project organized by the newspaper Izvestia, Radio Mayak, and the television channel Russia. 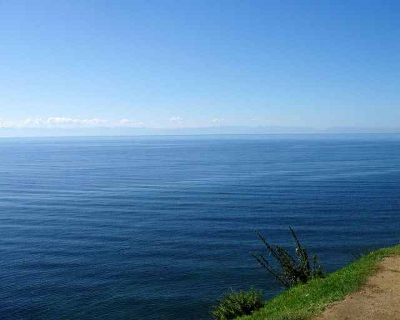 Lake Baikal (Russian: озеро Байкал) is the world’s oldest and deepest lake. It is 25 million years old (possibly older) and averages 2,442 ft deep! It is located in southern Siberia, in between Irkutsk Oblast to the northwest and the Buryat Republic to the southeast. It is the most voluminous freshwater lake in the world, containing roughly 20% of the world’s unfrozen surface fresh water. 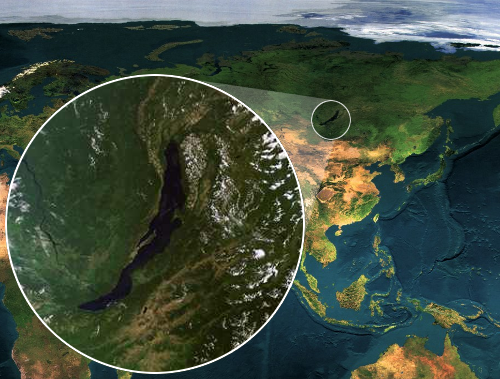 Location of Lake Baikal in Russia. The Valley of Geysers (Russian: долина гейзеров) is a geyser field on Kamchatka Peninsula in Russia’s Far East. 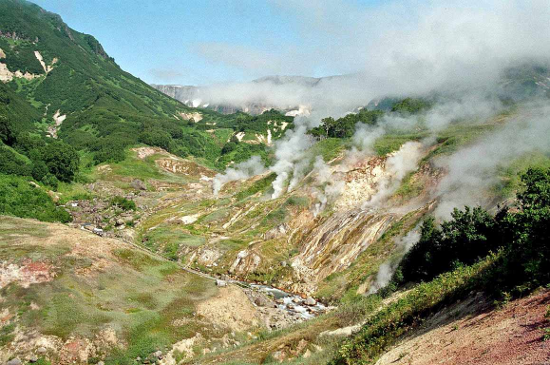 There are approximately ninety geysers and many hot springs situated in this six-kilometer long basin! Mamayev Kurgan (Russian: Мамаев Курган) is a dominant height overlooking the city of Volgograd (formerly Stalingrad) in Southern Russia. The original Mamayev Kurgan was a Tartar burial mound 102 meters high. 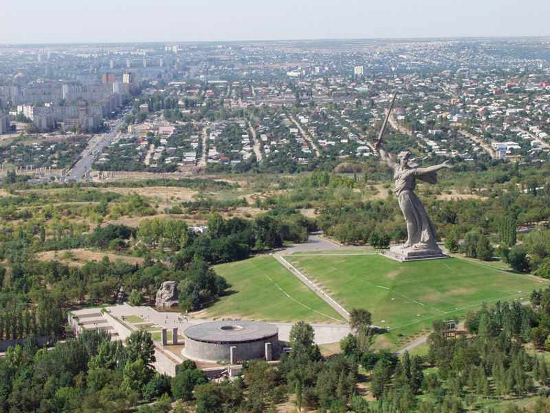 The current formation is dominated by a memorial complex commemorating the Battle of Stalingrad (August 1942 – February 1943). The battle was a decisive Soviet victory over Axis forces on the Eastern Front of World War II, and arguably the bloodiest battle in human history. At the time of its installation in 1967, the statue named “The Motherland Calls” was the largest free-standing sculpture in the world. 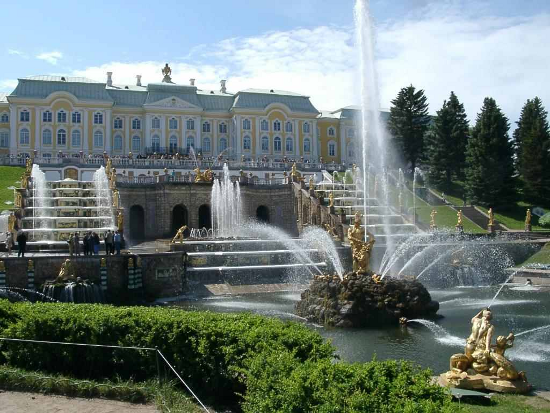 The Peterhof Palace (Russian: Петергоф) is a series of palaces and gardens located in Saint Petersburg, Russia, laid out on the orders of Peter the Great. The palace-ensemble, along with the city center, is recognized as a UNESCO World Herigate site. Saint Basil’s Cathedral (Russian: Собор Василия Блаженного) is a Russian Orthodox church erected on Red Square in Moscow in 1555-1561 on orders from Ivan the Terrible. It commemorates the capture of Kazan and Astrakhan. St. Basil’s marks the geometric center of Moscow. It has been the hub of the city’s growth since the 14th century, and was the city’s tallest building until the completion of the Ivan the Great Bell Tower in 1600. As a part of the program of state atheism, the church was confiscated from the Russian Orthodox community and has operated as a division of the State Historical Museum since 1928. It was completely and forcefully secularized in 1929, and as of today, remains a federal property of the Russian Federation. 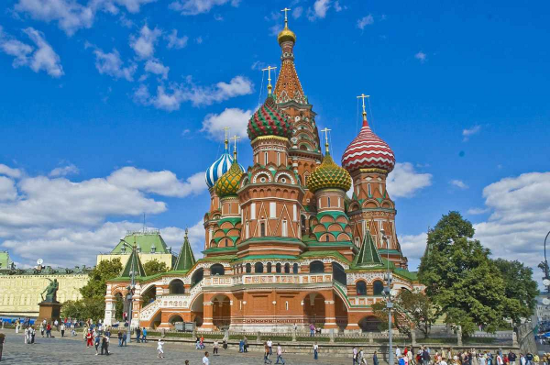 The church has been a part of the Moscow Kremlin and Red Square UNESCO World Heritage Site since 1990. 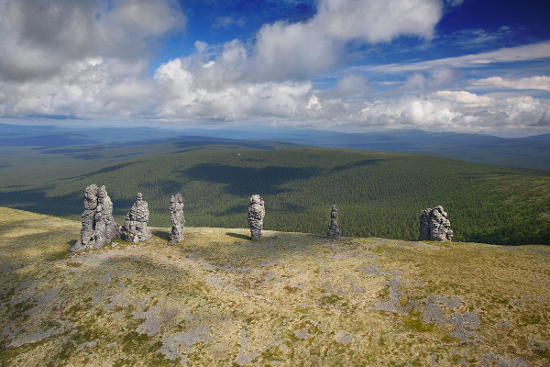 The Manpupuner rock formations (Russian: Маньпупунёр) are a set of seven gigantic abnormally shaped stone pillars located north of the Ural mountains in the Troitsko-Pechorsky District of the Komi Republic. These monoliths are around 30 to 42 meters high and jut out of a hilly plateau formed through the weathering effects of ice and wind. According to a local legend, the stone pillars were once an entourage of Samoyed giants walking through the mountains to Siberia in order to destroy the Vogulsky people. However, upon seeing the holy Vogulsky mountains, the shaman of the giants dropped his drum and the entire team froze into the stone pillars. The Manpupuner rock formations are a very popular attraction in Russia, but not well known internationally, and thus unspoiled by tourism. Mount Elbrus (Russian: Эльбрус) is a dormant volcano located in the western Caucasus mountain range, in Kabardino-Balkaria and Karachay-Cherkessia, Russia, near the border of Georgia. Mount Elbrus’s peak is the highest in the Caucasus, in Russia. While there are differing authorities on how the Caucasus are distributed between Europe and Asia, many sources agree that that Mt. 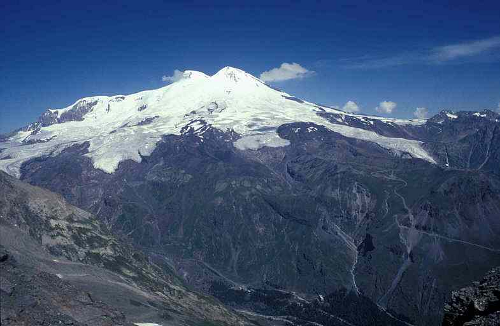 Elbrus is also the highest mountain in all of Europe, or the highest in western Asia. Mount Elbrus’s west summit stands at 18,510 feet tall. The east summit is slightly lower at 18,442 feet. this was an unknown site to me. found by looking at APOD another worthy site. i enjoyed your site but will spend more time later. Splendid post and great blog. Happy to have found it!